Starting its scientific surveying in July 2006, the European Space Agency's(ESA) Venus Express has been carrying out the most detailed study of the planet's thick and complex atmosphere to date. A European-built spacecraft has used its solar wings assails to skim through the sweltering atmosphere of Venus at the planet'soutermost border with space. The European Space Agency's (ESA) Venus Express spacecraftconducted five "aerodrag" maneuvers last week, which used the orbiteras a sensor capable of very accurately measuring the atmospheric density just 111miles (180 km) above the cloud-enshroudedplanet. To do these aerodrag measurements, the solar panels of VenusExpress were rotated through five sets of orientations, which changed daily, toexposed the wings to the vanishingly faint wisps of Venus'atmosphere at its boundary with space. The solar wing configuration generated a tiny but measurableamount of aerodynamic torque, or rotation, on the probe. This torque can bemeasured very accurately based on the amount of correction that must be appliedby reaction wheels, which counter-rotate inside the spacecraft to maintain itsorientation in space. That correction data, in turn, tells scientists just howthick or thin the atmosphereof Venus is at the point the spacecraft was during the maneuver. On the last day of the aerodrag campaign, which ended onApril 16, the solar arrays were rotated at plus and minus 45 degrees to theatmospheric flow, mimicking the vanes of a windmill. 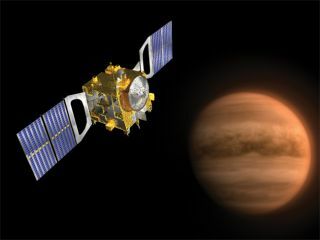 They maneuver allowedVenus Express to gather more information on the behavior of the molecules of Venus'atmosphere as they bounced off the probe's solar wings. "The aerodrag campaign went without problem, andconclusively demonstrated that VenusExpress can be securely and accurately used to sense the density of theplanet's atmosphere," said Octavio Camino, the probe's spacecraftoperations manager. "Venus Express has shown once again that it is a verycapable satellite." Camino said that the mission operations team will study lastweek's results to develop an optimised configuration for aerodrag campaigns inOctober and in 2011. Aerodrag testing was also conducted in 2008, 2009 andFebruary 2010. Continued positive results may enable Venus Express toconduct more sophisticated investigations deeper in the atmosphere, which wouldbe of immense interest to planetary scientists. The spacecraft launched toward the cloud-covered secondplanet of the solar system in 2005 and arrived at Venusa year later. The mission was extended for four months in May 2009, and thenreceived another reprieve in September 2009 ? this time, extending the missionto 2010. Aerobraking demonstrations are expected to follow through atleast 2011 or 2012, ESA officials have said.